Below are photographs and chronologically listed entries about the 'COS We Care' group who distribute free food on South Terrace opposite the Adelaide Theosophical Society every Sunday at 7:30am. The oldest reports appear first. Two women collect food from shops during the week. They distribute it on the footpath near the old TPI building on South Terrace near the corner of South Terrace and Hutt Street in the city. They call themselves COS and have a refrigerated van and supply a reasonably good range of unprepared food starting at 7:30am each Sunday. The two women who drive the COS refrigerated food van arrive near the TPI building on the corner of Hutt Street and South Terrace at 7:30am every Sunday. Their recent free contributions have included fruit and vegetables, bread, cakes, noodles, cereal, boiled eggs, coffee and frozen milk. They used to serve in front of the Hutt Street Centre, but were “warned off”. One client said he heard that Hutt Street was worried about losing clients, which could reduce their government funding. An employee, thought to be Brenda, at the Hutt Street homeless centre allegedly phoned the Adelaide City Council (ACC) earlier this week. She allegedly said that the 'COS We Care' free food service that distributes food and other items on Sunday mornings on South Terrace doesn’t have a permit to distribute free food. An ACC employee subsequently warned Anne and Laura from 'COS We Care' that they’d be fined if they provided free food this morning to homeless people. Hutt Street Centre claims their territory extends onto South Terrace and that 'COS We Care' is reducing their client numbers, and that this will affect their funding. Hutt Street Centre management had previously been infuriated when 'COS We Care' had distributed free food on the footpath in front of the Centre. That was why 'COS We Care' moved to South Terrace. Hutt Street Centre provides tea and toast on Sunday mornings along with limited amounts of takeaways then closes for the rest of the day. In contrast, the two women from 'COS We Care' give away fruit and vegetables, processed food, home prepared food, clothing and shoes, and tea and coffee at 7:30am each Sunday in the Parklands on the corner South Terrace and Hutt Street. They volunteer without pay to collect the donated food during the week and even pay for their own petrol and vehicle expense plus $500 a year for liability insurance. In contrast, Hutt Street Centre has salaried employees who personally depend on funding from government departments, and from corporate and private donations. If homeless people and other clients on Sundays go to the superior 'COS We Care' van, this would affect Hutt Street Centre’s funding. So Hutt Street Centre management appears to be trying to close down 'COS We Care' in an attempt to maintain their “market share”. Should this happen, the quality of food for homeless people will be reduced. This morning, the 'COS We Care' distribution would have included 35 kilograms of cherries, but instead they arrived with an empty van and apologised to the homeless people who met them at 7:30am. The Hutt Street Centre was asked on Monday to comment on the claim that one of their paid employees phoned the Adelaide City Council complaining that Laura and Ann, who call themselves the COS food van, give away free food and clothing on South Terrace without a permit. The Hutt Street Centre has been losing Sunday morning clients to the superior and volunteer COS food van and fear a reduction of funding due to the loss of clients. An employee at The Hutt Street Centre, who gave her name only as “Joanne”, said she’d ask management if they wanted to respond. They haven’t taken the opportunity to deny the accusation. Ann and Laura obtain donations of new clothing, end of day restaurant and cafe food, toiletries and hygiene products, and fresh fruit and vegetables on their own time and without pay. Last week, the Adelaide City Council told Ann that if they gave away free food on Sunday they’d risk heavy fines. This Sunday the two women will be there with a permit to give away free food, or an exemption, or with the media. Maybe the media could also knock on the doors of the Hutt Street Centre speak to them. The COS food van arrives at the corner of Hutt Street and South Terrace at 7:30am on Sunday mornings, then 9:00am at Whitmore Square and afterward, WestCare. The Adelaide City Council told Ann from the COS food van that the Council doesn’t require a permit for the distribution of free food. However, they’re formulating new rules for what will become a required permit for such acts of goodwill. This is the result of a complaint from the Hutt Street Centre. Ann says that another Council employee told her that Hutt Street’s cook, Brenda McCulloch, initially made the complaint against the COS food van. Brenda was unhappy that COS was giving away free food to homeless people. Brenda also complained that Hutt Street Centre homeless patrons have become more fussy since the COS food van began distributing a superior Sunday breakfast. 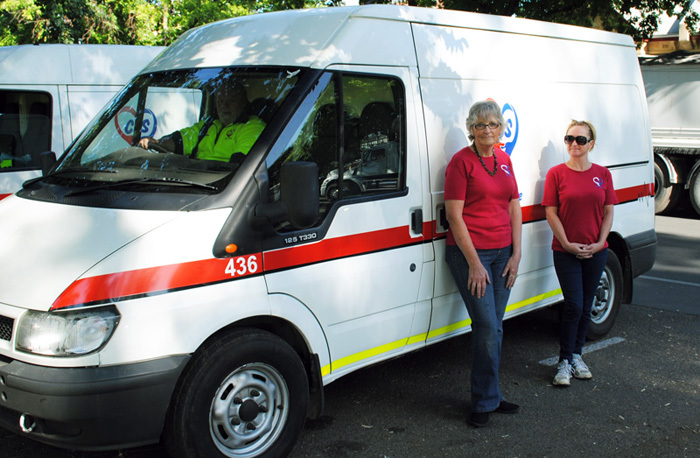 The COS food van distributes food, toiletries and clothing every Sunday at 7:30am near the corner of Hutt Street and South Terrace, Adelaide. (above) The 'COS We Care' voluntary food service to homeless people stopped their operation last week when the Hutt Street Centre objected to the distribution of free food to the homeless near its building. A complaint to the Adelaide City Council brought the threat of heavy fines. While awaiting the outcome of discussions with the Council, Ann of 'COS We Care' turned the ripe cherries into jam, which were distributed today after the Council concluded that no vender permit was required for people giving away food. A man talking to those sleeping in their vehicles told me at daybreak that the ‘COS We Care’ food van wouldn’t be arriving. He said Brenda McCulloch from The Hutt Street Centre had complained to the Council that the van didn’t have a food vending permit. A person whom I had thought was a Hutt Street Centre spy was most vociferous about that institution trying to stop ‘COS We Care’ from distributing free food to the homeless. Another person, an older man, had clear insight into how the Hutt Street Centre has developed from a benevolent institution into a bureaucratic business more concerned with maintaining staff salaries. He said that when Brenda was hired, she closed the place on Saturdays. At 7:20am the cry arose, “They’re here,” as two refrigerated ‘COS We Care’ Transit vans turned right off Hutt Street onto South Terrace. When the vehicles were parked alongside each other, Laura, Ann and John unloaded tables, crates and a gas stove. One of the homeless men helped. Just twelve people were awaiting the van, but within the next hour another 35 emerged from the parklands and back streets. These were good numbers considering that word on the street was that Brenda had stopped COS.
Laura fired up the gas stove to heat water, while coffee was initially made from hot water brought in thermos bottles. Plastic crates containing green and ripe tomatoes, onions, carrots, odd-sized cucumbers, lettuce, potatoes, celery and capsicum were laid on the grass. What was notable was the high quality. The tables held rice crackers, cornflakes, 2-minute noodles, sweetened soy milk, dry pasta and spaghetti, tinned beans and spaghetti, prepared rolls (the contents of which I didn’t see), bread and hamburger buns, and a huge range of quite fresh iced buns in various colours. Also, brand new T-shirts, of which the Vitamin Derelict put one on straight away. It fitted him perfectly. 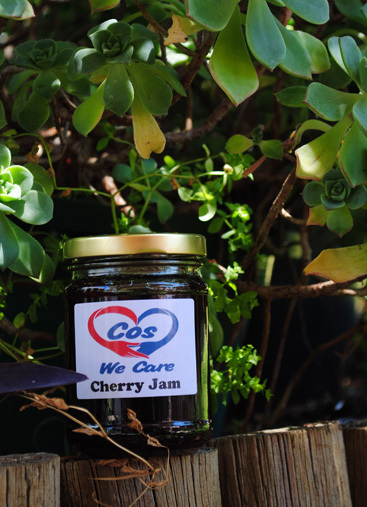 There were also jars of cherry jam made by Ann from the 35 kilograms of donated cherries that weren’t distributed last week for fear of being fined by the Adelaide City Council. Zulu arrived late, still recovering from being drunk the night before. John the New Zealander, with his bad heart, stayed in his van. When he finally emerged, his face was frighteningly pale. John, Ann and Laura have been in the trucking business, hauling oversize loads in northwest Australia. They spent their own money this past week on fuel to collect and drive their food into Adelaide from the northern suburbs. John said they initially gave Hutt Street Centre boxes of crackers and dozens of pairs of Bond’s socks, but after a screaming and abusive phone call from Brenda McCulloch they’re distributing everything direct to the streets. John says they’re planning to distribute in a Salisbury park that each night is dotted with tents, which are packed up at daybreak. Ian Hitch-Cox and his board of management must realise by now that The Hutt Street Centre has drifted off course. Two self-funded groups don’t begin distributing food on or near his front doorstep without good reason. Who runs the COS We Care food van? Ann, her husband John, and Laura collect donated food from small shops in the suburbs north of Elizabeth. Their main day is Saturday when they spend 12 hours collecting, re-packaging and refrigerating the donated food. They also collect food during the week from market gardeners, and fruit and vegetable shops. From chemists they get donated women’s hygiene products. They receive corporate donations, but donations come mostly from “little people”: shop owners and individuals. Some transportation costs are paid from their own money. Laura’s previous career included driving oversize semi-trailer vehicles in the outback. Ann and John previously operated a transport company and understand logistics. This gave them valuable contacts with transport companies who now donate to the Cos We Care free food service.